The Championship. A year-long battle, so they say. Fancy pants football will only get you so far, you’ll not succeed without some experienced heads on the pitch. This, ultimately, is where Watford fell down last year and nowhere else was this more apparent than in the centre of midfield. Nathaniel Chalobah pranced with rakish virtuosity, Almen Abdi did his thing quietly and brilliantly, Jonathan Hogg stormed around shouting at nobody in particular and kicking things, but the one grizzled leader in the pack, the man bearing the scars of battle, John Eustace, was nowhere to be seen. As it turned out, he had one scar too many. The skipper, who has an injury log as long as his over-hit defence-splitting chips, only featured a handful of times over the season as a niggle in his back kept him sidelined. Now back to fitness but out of contract, Eustace has sought pastures new, playing in both of Derby County’s pre-season friendlies to date. One can’t doubt the talent that is stored in Watford’s ranks following the most recent spate (pending Football League approval) of foreign arrivals, but we’re still missing that midfield general. Gianfranco Zola will be hoping that he’s found that missing piece in Iriney Santos da Silva. Iriney comes on a year’s loan from Granada, having made 21 starts in La Liga for the rojiblancos during the 2012/13 season. A fixture in the side for the first five months of the campaign, he lost his place to young Malaga loanee Recio in January and struggled to force his way back into the two man central midfield. Still, over twenty games in one of the world’s top divisions isn’t bad going. The Brazilian only arrived in Granada last summer, signing on a free after he rejected a new contract from Andalusian rivals, Real Betis. It was there that he made his name in Spain. In his three years at the club, the combative midfielder played 108 games, ending his stint as captain in the Spanish top flight. When Betis signed him, at the beginning of the 2009/10 season, they had just fallen into the Segunda for the first time in eight years – a period that had seen them dazzle with Denilson and reach several continental competitions. The club was in turmoil; days after their relegation over 60,000 fans protested in Sevilla against Manuel Ruiz de Lopera’s ownership of the club, one banner brandished by an ultra read: ‘Lopera: Vende o muere’ – Lopera: sell or die. It would be another year before Lopera, who had served prison time several years earlier for tax fraud, sold his share in the club – spurred on by the possibility of further charges. By this time, Iriney had helped guide the Béticos agonisingly close to instant promotion – finishing joint second on points, but fourth on head-to-head. The next year, however, with the club in a more stable position politically, they finished as champions, with Granada joining them in La Liga through their play-off victory. The Brazilian, by this point captain, was the beating heart of the successful Betis team, playing 36 of the 42 league games and scoring three goals, including a peach of a winner in the final game of the season against Villareal B. Goals were not Iriney’s forte however – he’s got six in the eleven years he’s been in Spain – his presence in midfield and aggression are what endeared him to the Betis faithful. That season, in his 36 games he managed to accrue EIGHTEEN yellow cards and a solitary red. The following year, in the top flight, he calmed down and lowered that tally to twelve in 31 games as Betis finished comfortably midtable. Unfortunately for them, Iriney’s liking of Andalusia was not restricted to the green part of Seville. With Betis struggling financially under their new owner – Luis Oliver, who had previously taken Cartagena FC and Xerez close to bankruptcy (football owners, eh?) – the club offered the midfielder, now 31, a new deal on greatly reduced terms. John Eustace, you will remember, asked to forego his substantial appearance bonus so that he could play for Watford in one of our many recent times of need. While it seems that Iriney covers most of the bases that the skipper leaves unmanned, this generosity to a club that has taken you to its heart isn’t one of them. @SanteroTrece: Jajajajajajajajajajaja Didn’t Iriney flee Betis saying he’d always wanted to play in Granada? @Alvarosotop: I do not usually write about football, but I’m glad Iriney has been given to the second English division while Betis will play in Europe. @jhonny20walker: Iriney, for money, has gone from playing in Europe to playing in the English second division. How quickly love turns to hate in sport. Betis is where Iriney became a notable player in Spain for the first time, but it was not his first taste of La Liga. After making 26 appearances for the Sao Paolo club Sao Caetano – including playing a few games as they won the league, yet finished runners up due to the all-encompassing play-off system in the Brazilian Serie A in 2001 – he was snapped up by Rayo Vallecano at the age of 21. He made his debut that same 2002/03 season in La Liga, but the Madrid side were relegated and the following year were once more demoted to the Segunda Division B. After making 85 appearances during the club’s descent thorough the pyramid, Iriney moved back to La Liga with Celta Vigo, where he played 55 times over two and a half years, despite a cruciate injury in his first season. From there he spent one and a half seasons on the fringes of Almeria (19 starts) before making his Betis switch. 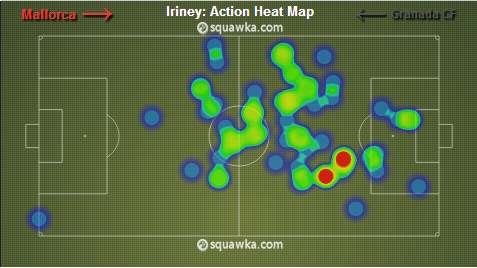 Iriney brings a wealth of experience, and is the sort of player that can galvanise flagging teammates. Forever Betis, a blog: ‘He can lift the crowd with a single tackle, he can raise the tempo of the team’s play by simply charging around for five minutes, and when he loses, it clearly hurts’. The heat map above (you know you’re big time when you’ve got heat maps) shows that the Amazonian midfielder likes to sit in front of the back line and marshal the midfield. He seems however to have better use of the ball than a Eustace – his pass completion in La Liga last season was as high as 83%, the third best in Granada’s squad. Watford’s central midfield corps is looking pretty tasty at the moment: Iriney joins Abdi, Hogg, Battocchio, Fabbrini, McGugan and Jenkins as well as youngsters like Connor Smith and Luke O’Nien. At 32, Iriney is a year and a half younger than Eustace. Players, like real people, age physically at different rates, of course, but however Iriney’s body holds up, we have the squad to cover for him. When he is fit, and not suspended, he could be the aggressive midfield leader that this team is lacking. One of the only things it’s lacking. Things are looking good folks.